Posted September 4th, 2018 by Mobile Music School & filed under Benefits of Music Education. This week we take a look at the benefits of cross-curricular programmes on children and how they reinforce other school subjects by enhancing their learning. Here at the Mobile Music School, we believe classroom music programmes set a firm foundation for students and enhance their learning ability in a way that is enjoyable for them. As well as being fun-filled and activity-based, our music programmes are based on the three core strands of the music curriculum. Our highly professional and experienced music tutors have a deep understanding of the curriculum and are able to incorporate other subjects such as Irish, Geography, History, English, Maths and Science. 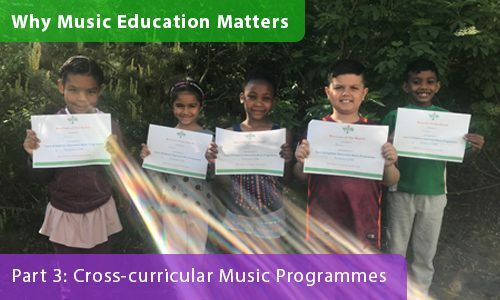 Not only do our programmes educate students in Music, but they also reinforce all other aspects of their school learning in a fun, interactive and educational way. Our weekly music lessons as part of our classroom music programmes support all aspects of learning and education. To find out more about what’s involved in our classroom music programmes, please visit the classroom music page of our website. To learn more about how our classroom music programmes and how they can benefit your school, please get in touch with us to discuss these options in further detail. Why Music Education Matters – Round-up coming next week!